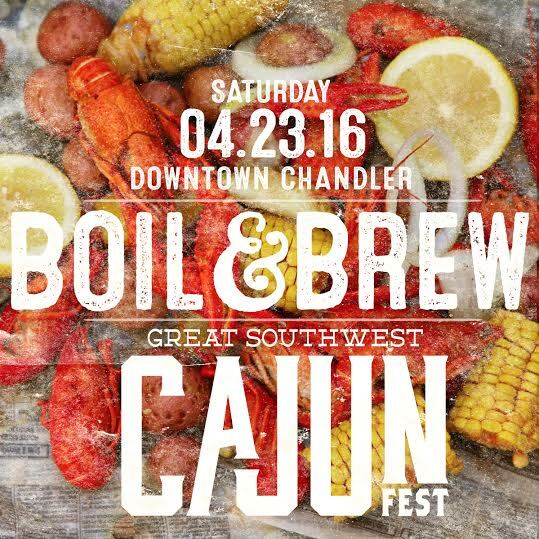 Enjoy a taste of Cajun culture during the Southwest Cajun Fest on April 23, from noon – 9 p.m. in downtown Chandler. Showcasing the heart and soul of New Orleans paired with Arizona fusion and flavor, the festival will bring regional dishes from some of the valley’s best restaurants, transporting you to the southeastern region of Louisiana. The main event, a big ol’ crawfish boil, provided by Angry Crab, gives guests a sample of Louisiana tradition, boiled to perfection with red potatoes, vegetables, lemon, special seasonings and more. Other menu items from Angry Crab include shrimp, charred oysters, crawfish rolls and cornbread. Hungry patrons can expect delicious food from Creole Cajun Bistro, dishing out a variety of authentic Cajun cuisine. On the menu are Po’ boys and crawfish mac n’ cheese, which is creole Cajun seasoned crawfish in creamy Parmesan, Monterey jack and cheddar cheese sauce. Or try alligator on a stick, fried crawfish or whisky bread pudding, which is bread pudding cooked in a whisky sauce. Honey Bear’s BBQ will serve Jambalaya, shrimp Etouffee, fried cat fish, fried chicken, spicy hot links and red beans and rice. Don’t forget to stop by Raging Cajun Smoking BBQ, bringing an array of barbequed Louisiana food including crawfish, shrimp and alligator. JJ’s Louisiana BBQ is bringing BBQ ribs, pork, brisket and chicken. Snack vendors will serve root beer floats, ice cream cones and other tasty treats. Presented by Angry Crab Shack, the Southwest Cajun Fest will feature live music by The Urban Renewal Project, a Los Angeles based band combining jazz, soul and hip-hop to keep spirits high and feet dancing during the festivities. Brought to you by Abita Brewing, festivities also include themed zones such as Bourbon Street, French Quarter, Garden District and more. Patrons of all ages are encouraged to dress in festive parade style attire and join in on the fun and celebration. The event will take place at the Dr. AJ Chandler Park—125 E Commonwealth Ave, Chandler, AZ 85225. General admission is $10 and kids 12 and under will be admitted for free. VIP admission is $65, which includes catered food, six adult beverages, access to private seating in the VIP area, private restrooms and front stage access. VIP tickets are only available in advance, online at www.southwestcajunfest.com. A portion of the proceeds from the Great Southwest Cajun Fest will support the Downtown Chandler Community Partnership (DCCP). DCCP is a 501(c) 6 nonprofit corporation whose mission is to mobilize leadership and resources to advance the development of downtown Chandler as a regional destination for shopping, dining, living, culture, and the arts. It works on behalf of the Enhanced Municipal Services District, created in 2006, to provide enhanced marketing and promotion, safety and beautification of the downtown area beyond what is done by the City of Chandler. For more information, visit www.downtownchandler.org.